One of the things you often hear as a parent is about that the way your child is sitting is detrimental to their development. When MissC was a baby, we attended classes where we were told repeatedly about how you were not to sit a baby who could not sit by themselves. As your child gets older, you then get told to make sure they are sitting 'properly' and in particular not sitting in a w- formation. The case for not propping a baby up is made less by people with training in child development than the case against W sitting and so is far easier to pick apart. Since nobody has investigated the emotional outcomes of sitting a baby, I will focus entirely on the physical side effects. It is true that infant motor development is linked with time spent on their stomach with babies who sleep more on their stomachs developing faster than those who sleep on their backs 7. Babies who spend more time on their front awake also tend to reach motor milestones faster than those who do not 14. If a baby is 'propped up' excessively it may limit time spent on their front and slow their reaching of developmental milestones. However, in some countries babies are 'trained' and sat for 40-60% of the day and these babies tend to show advanced hand skills, have earlier better head control and sit and walk earlier than those who are not 15. As such it is difficult to determine the effect of 'sitting' a baby on its motor development. Now in terms of the effct on the body and appropriate positioning. Many studies have been done examing the changes in muscle movement when a baby is learning to sit. It has been determined that development of sitting is a dynamic process where infant learns to control the bodies degrees of freedom to capture a sitting process 8. Some of the necessary mechanisms for weight distribution when sitting are present prior to the infant being able to sit independently 10. There is no evidence that it is harmful on their spine. In fact, 'propping' on the arms, is considered a natural part of the development of sitting and not detrimential to children's development 11. In fact the desire to reach while sitting in a propped position may in fact drive motor changes involved in sitting 16. Children who already have problems may prefer the w-position as it gives them added stability or because it is comfortable due tot their pre-existing condition 2. Studies have found that children with normal development can compensate for their sitting position such that crouched positioning is not detrimential to them 8. However sitting position has been found to be important to children who have motor impairments who are not able to compensate in the same way 9. In terms of the effects of the body there has been an association found between w-sitting and bilateral flat foot 5 along with intoeing 13. The direction of the association is not clear but it is worth noting that on the study of intoeing a large number of children (63%) had this pattern of sitting and many did not have intoeing. Ceasing sitting on their feet (as in w-sitting) has been found to speed the resolution of internal tibial torsion although most cases resolve spontaneously regardless 3. It is worth noting however that the most common causes for excessive w-sitting has to do with the position of the femur that is present at birth so there most cases are a sign of a condition being present rather than contributing to the condition 3. Some sitting posture is not suggested for anybody, specially, W sitting posture affects kids health and parent should be concious about kids sitting style. Highly informative post! 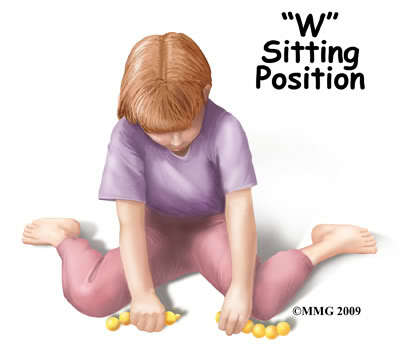 Yah, W-sitting is a floor-sitting position where the knees come together and the feet are spread out to the side of the child's hips. It means no excessive stress joints, muscles or knees. thanks.